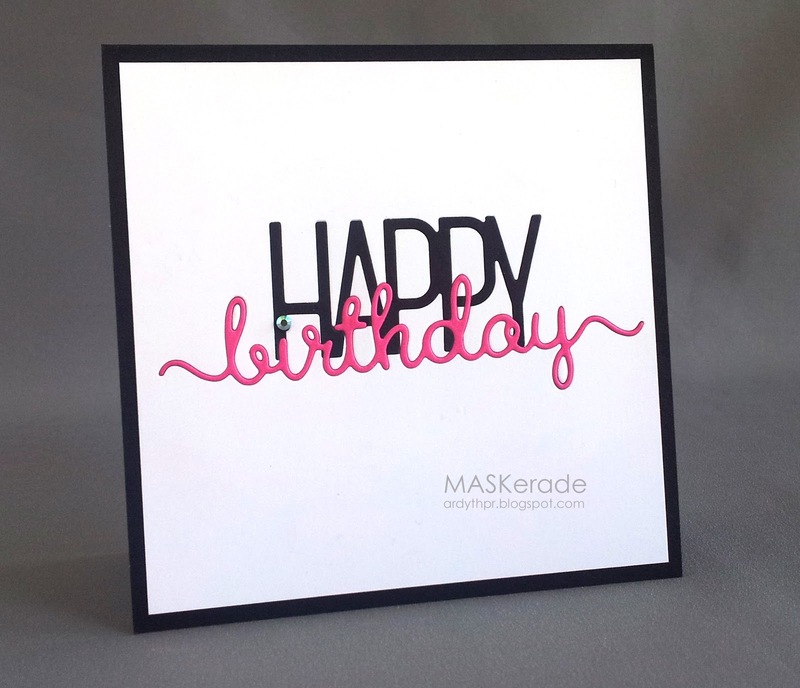 For those of you who follow MASKerade and my Pinterest inspiration board, this card will come as no surprise. In fact, you're probably wondering what took me so long, right? For those of you interested, here's a how I did these inlaid die cuts - I'm sure there are many other ways, but I've found this works pretty well. 1) Cut white panel. Die cut HAPPY and remove it. 2) Die Cut HAPPY in black. 3) Lay double-sided (I use Sookwang) tape across the back of the opening. This creates a sticky 'nest' for your black die cut to sit in and also keeps all the tiny white bits stuck down. 6) Turn the panel over and burnish it (rub it) with a bone folder. This makes sure that everything's stuck in there really well. 7) Repeat with the other HAPPY. 8) Take the release paper off the double-sided tape and adhere your panel to a sheet of computer paper. This will hold everything together when you cut the BIRTHDAY. 9) Repeat 1-6 with the BIRTHDAY die. This time, though, I coloured the white die cut from step 1 and laid it back in in step 4. Try harder than I did to get your rainbow colours in the right order, though! 10)Trim excess computer paper and make your card. 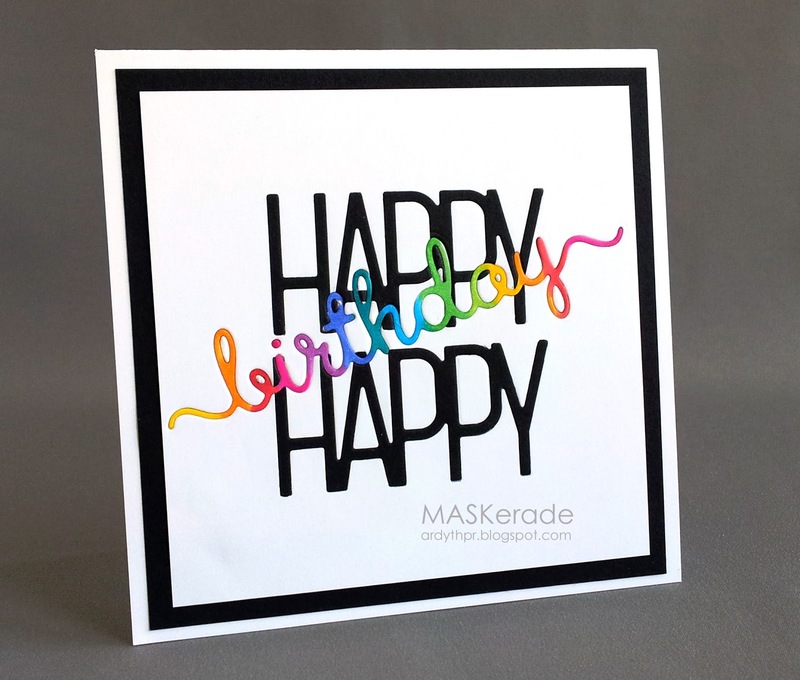 ETA: Papertrey for the Happy Die and Clearly Besotted for the birthday die. This is just fabulous. And, thanks for the tutorial. This is absolutely stunning!! Can imagine it would have been a bit fiddly but so totally worth it. The rainbow 'birthday' certainly pops against the black and white. Its perfect! Truly two fabulous cards. Love them both! What a brilliant inspired card!! What a great design and thanks for sharing the cutting tips! Love these cards...can you tell me what dies you used? Thanks in advance! Awesome card! Love the colors you used for birthday. Thanks for sharing how you made it. Gorgeous! That's a lot of piecing together....well worth it. Thank you for taking the time to 'splain the process of this amazing idea to all of us so that we can wow folks on our blogs with rainbow designs, just like yours...in random non-rainbow order! This design looks so wonderful!!! Fantastic card! !